If an airline has a claim against a ground handling operator in Bulgaria, most probably the claim will be resolved according to rules of the signed IATA Standard Ground Handling Agreement (SGHA). In extremely rare cases, the ground handling company in Bulgaria will have its own custom handling agreement. All major ground handling companies such as Swissport (servicing Sofia Airport through Swissport Bulgaria JSC) regularly update their SGHA when IATA produces a new draft. As the ground handling company is dealing with passenger and cargo on behalf of the airline, any claims against the ground handler from third parties, are to be covered by the carrier third party liability insurance (also covered by the Warsaw Convention System and the Montreal Convention 1999). The SGHA identifies specific liability of the ground handling company if damages are caused to the aircraft hull (airframe). In that case, the appointed lawyer should look into the negotiated limits of liability set in the SGHA and identify what amount will be covered by the aircraft hull insurer and what amount by the ground handling company itself. The agreement might have set unrecoverable amount threshold i.e. claims for damages less than $3000 shall not be sought. Air carrier can seek compensation for cargo damage and loss not only for intentional acts or omissions of the ground handling agent but also for acts of negligence. Again, one should look into the particular SGHA, which identifies the limits of liability and indemnity. 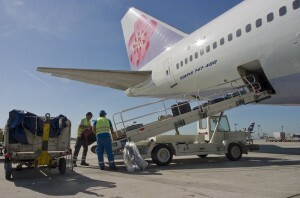 The disputes between carriers and Bulgaria ground handling companies can be resolved in the jurisdiction agreed in the particular SGHA.The typical jurisdiction would be Bulgaria and the applicable law will be the Bulgarian law and competent courts will be the Bulgarian courts. Instructing a local Bulgarian aviation lawyer with litigation expertise will be required in order to solve the matter as quick as possible. It is crucial to summon the ground handling company’s insurer as a party of the case, so that the claimed amount is recovered quickly. Often if this is not done, the claim to the insurer is lost due to statute of limitations and the ground handling company might go bankrupt if they don’t have the sufficient funds to pay for the damages. Unlike the rest of the world, the Bulgarian insurers will likely go to court, rather than settle out of court. In this case a litigation is a must if the airline want to recover damages or loss from the ground handling agent.